Pins, Brooches & Pendants - Vintage and classic JEWELRY FINDINGS are ready for your creative additions. Jewelry Pins, Pendants and Other Jewelry Findings Ready For Your Creative Hand. Bright GOLD or NICKEL finish resists tarnishing. Holds a 9mm round flat-back insert if desired. 3" long overall x 5/8" diameter stamped metal top with open heart-shaped rim. Bright Silver Finish. 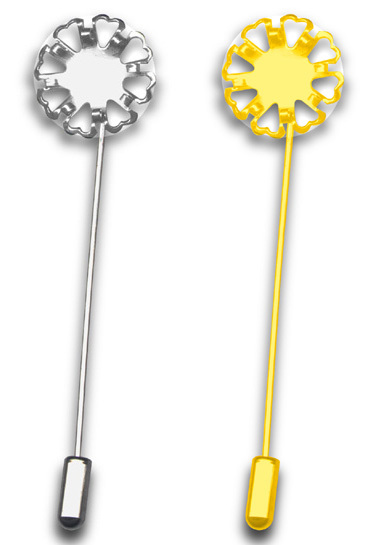 Pin-back with safety clasp. 2" high. Holds 1" round flat-back insert. 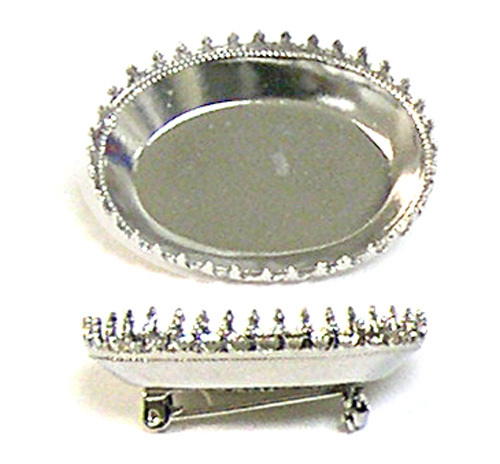 Also can hold six 3mm pointed-back rhinestone or round bead if desired. Cast metal. Antique Gold Finish. Holds 1-1/2" x 1-1/8" oval insert. (40 x 30mm.) Cast metal. Bright GOLD finish resists tarnishing. 1-1/8"H X 1"W. Pin-back has safety clasp. A beautiful way to express your love! Stunning as is, but can also be decorated with 23 9ss pointed-back rhinestones, etc. for added charm. Cast metal. 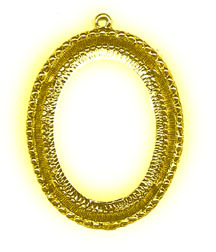 G) Double-Sided Pendant with bright GOLD finish that resists tarnishing. Can hold a 3/4" x 1" oval object. Simple design will not detract from objects displayed. Cast metal. H) Large Oval Brooch with SILVER finish that resists tarnishing. Pin-back has safety clasp. 1-1/2" x 1-1/8" x 1/4"D. Stamped metal. 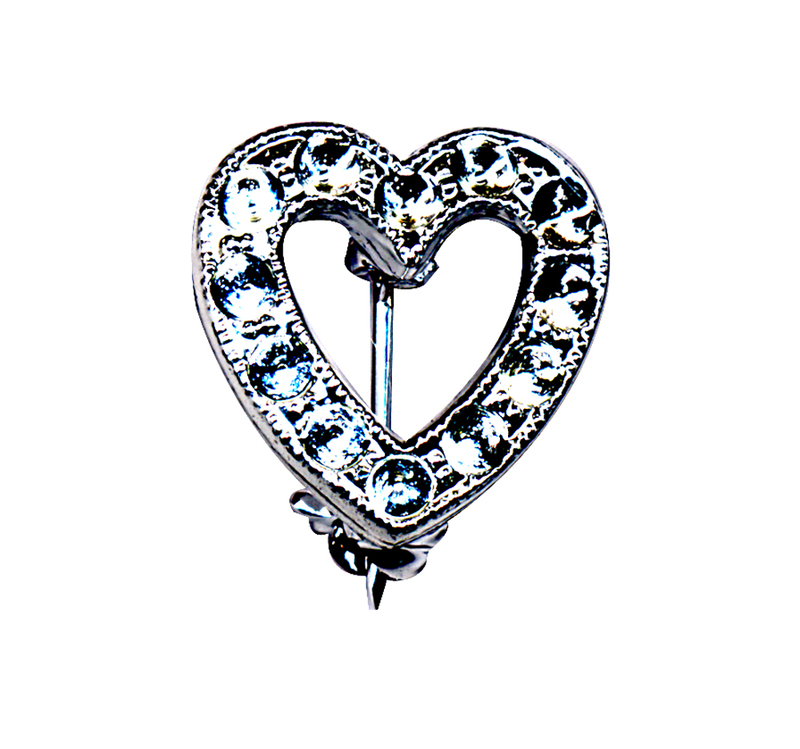 I) Small Heart Pin with SILVER finish that resists tarnishing. Pin-back has safety clasp. 1/2" x 1/2". Holds 12 6ss pointed back inserts if you desire to apply them. Cast metal. Bright NICKEL finish. Holds a 9/16" round flat-back insert if desired. 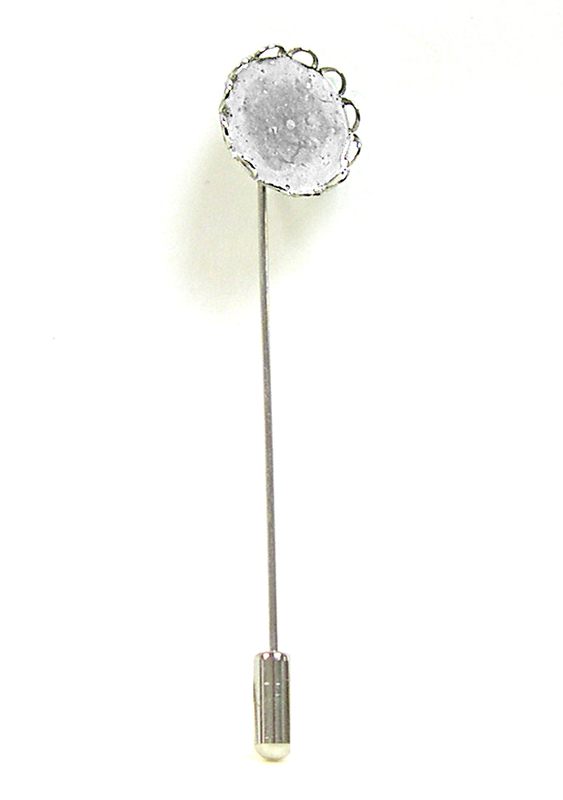 3" long overall with stamped metal top that has open scalloped rim. with bright SILVER or GOLD finish resists tarnishing. Pin-back has safety clasp. Just 1"W x 1"L. Closed frame design lets you hang a hanky or charm from it. Can be enhanced with 1.5mm pointed-back rhinestones etc. Cast metal. 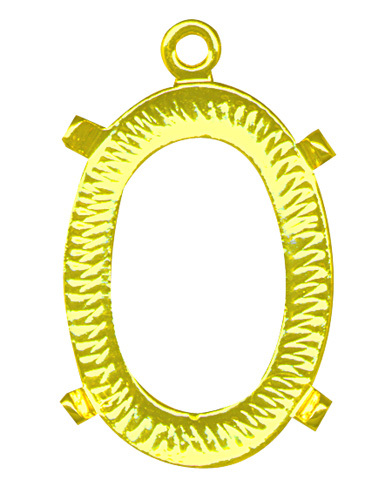 (E) Oval Pendant, Ant. 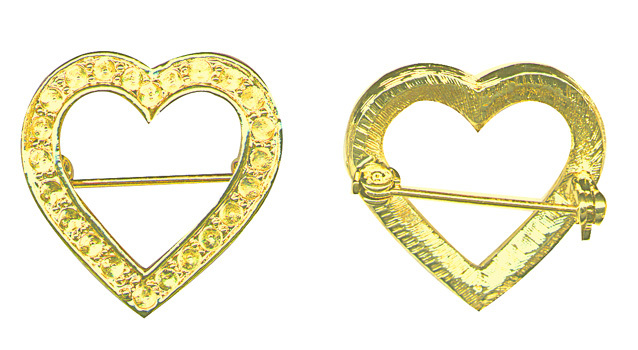 Gold Cast Metal 1-1/2 x 1-1/8"
(I) Dainty Heart Pin with Silver Finish 1/2" x 1/2"
(J) Dainty Stick Pin with Nickel Finish - 9/16" Dia.